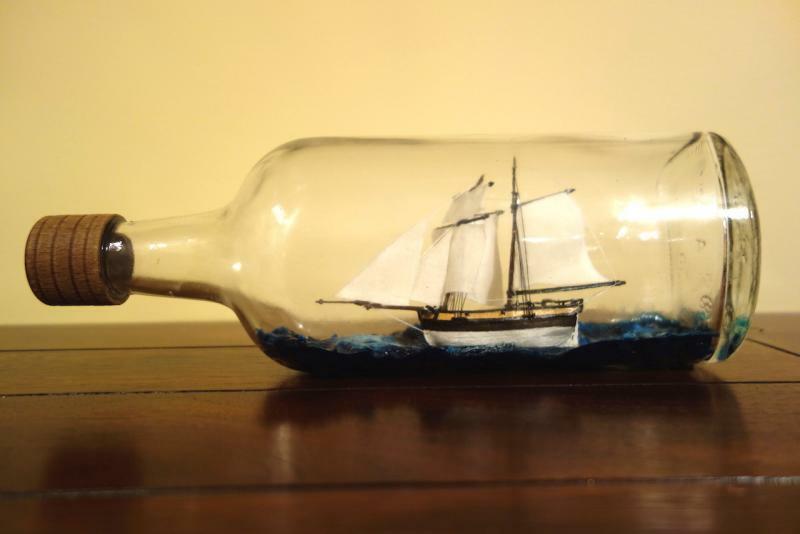 By Landlubber Mike, April 16, 2015 in New Member? 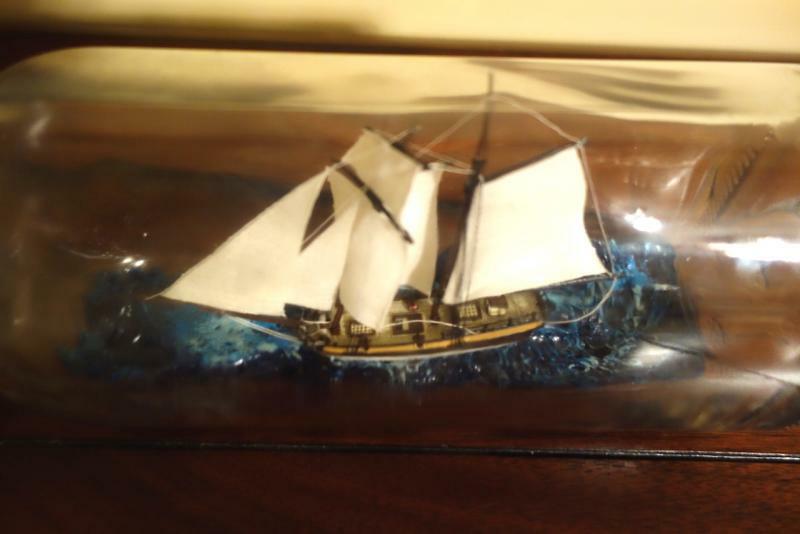 I'm very new to the hobby, having started with more traditional model ship building six years ago. 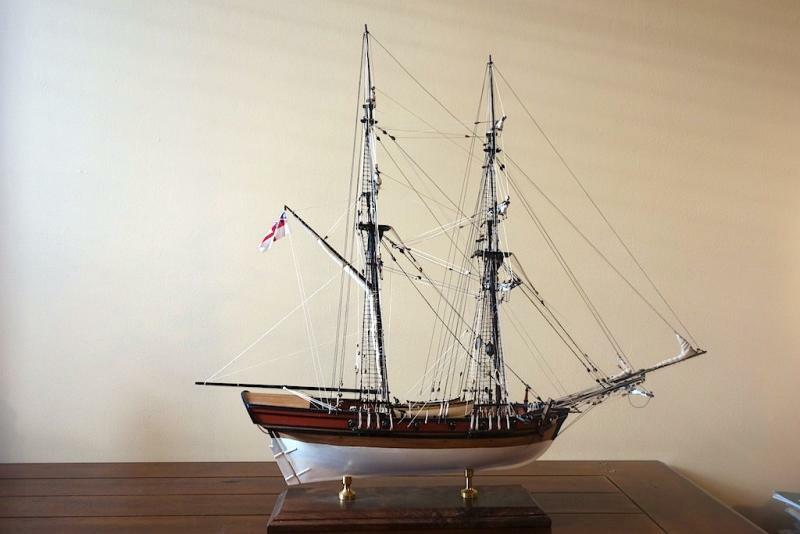 Last year I finished my first ship model, the Brig Badger. A relatively simple model, but with kids, work, etc., it ended up being a five year build. Along the way I picked up the Amati Hannah SIB kit mostly as a novelty. I started the kit maybe three years ago, and finally finished it a couple of months ago after being inspired by the work of folks like DSiemens and IgorSky. 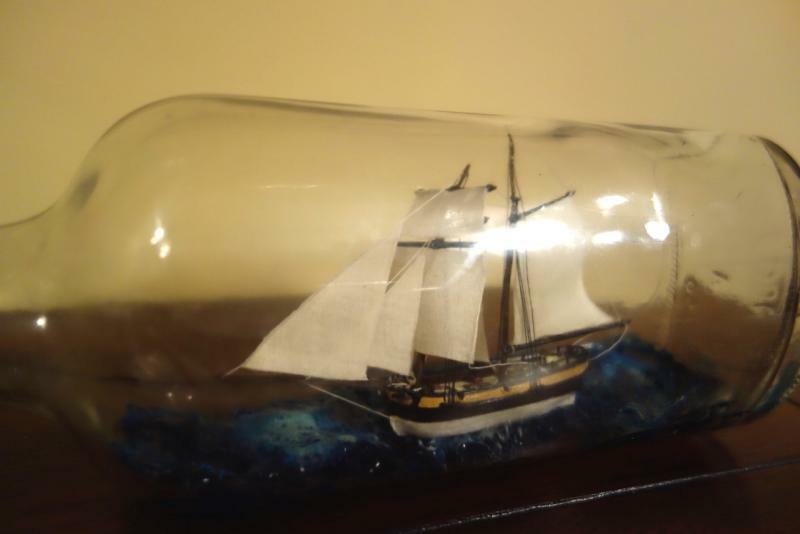 I did make a number of modifications to the kit, including painting the ships, replacing the kit sails, and adding sea to the bottle (I used Water Effects from Vallejo - an adventure I can maybe describe in another thread). The kit was a very nice one, but I thought that I could do better than using photo-etch pieces for the masts and spars, etc. The photo-etch are simple and convenient for a kit, but have lack a three dimensional look, have out of scale holes for the rigging, and are prone to snapping if bent too many times (don't ask me how many times that happened - I still have PTSD from the repairs). 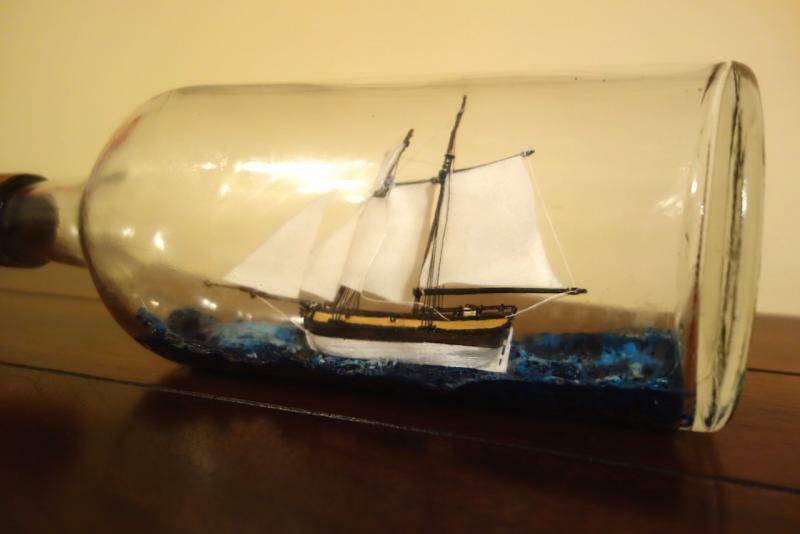 I probably will focus my modeling time on building larger scale ships, but I definitely have the SIB bug. I bought half a dozen books on SIBs, am an avid reader of many of your webpages, and started collecting interesting bottles and materials to start my first scratch SIB build. I'm still in the researching/learning/experimentation stage, but I plan to start my first scratch build sometime in the next couple of months. In the meantime, I plan to study various techniques, including adding sea to the bottle. Thanks, and I look forward to being a member of this community! I am glad you signed up and your build looks really good! Good to see you on BSB Mike! I don't think I had seen your brig before she's very impressive. Welcome to BSB. Wonderful images of your first static ship, and your first SIB. I like that you went the extra mile and painted the Hannah. I too have static ships in the works as we speak. I know that for me, whether SIB or static they can teach me something that helps in building the other style. Well done. I look forward to your future shipyard builds! Welcome Mike, Igor mentioned the brass parts, I agree. Modifications will be made. I look forward to seeing more from you. looks like you really do good work.